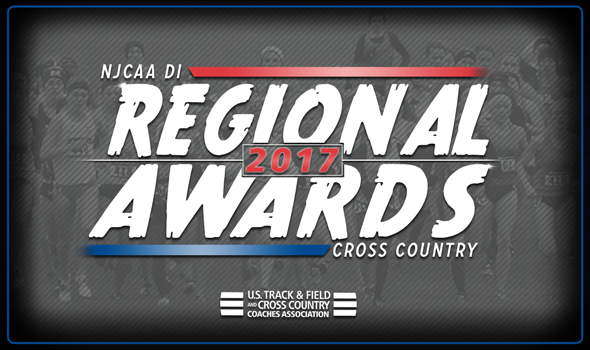 NEW ORLEANS – Regional Athletes and Coaches of the Year for the 2017 NJCAA Division I Cross Country season were announced Tuesday by the U.S. Track & Field and Cross Country Coaches Association (USTFCCCA), as voted on by member coaches from that division. Mastandrea, a sophomore, won the Region X title in 25:31. He also captured an individual title earlier this season at the Hagan Stone Classic. Dirane, a sophomore, won the Region VI title in 26:09. That was his fifth win of the season. Franklin, a sophomore, won the Region XII title in 25:40. He also ran well at the Louisville Sports Commission Cross Country Classic earlier this season. Achengli, a sophomore, won the Region XI title in 24:48. He also posted individual victories this year at the MSU Spartan Invitational and the Jim Drews Invitational against NCAA Division I, NCAA Division II and NCAA Division III competition. Fitzpatrick, a freshman, won the Region XVIII title in 25:24. He also won individual titles at the Saint Martin’s Classic and the University of Providence Open. McKoy, a freshman, won the Region XV title in 20:22. She also won an individual title earlier this season at the Kingsborough (N.Y.) Invitational. Kibet, a sophomore, won the Region VI title in 18:45. That was her third win of the season in addition to first-place finishes at the Oklahoma State Cowboy Jamboree and the Fort Hays State Open. Da Silva, a sophomore, won Region XII title in 18:23. She also nabbed individual victories at the Indiana Intercollegiate Championships and the Louisville Sports Commission Cross Country Classic. Cohen, a freshman, won the Region XI title in 17:22. She also posted a win at the Tori Neubauer Invitational against top-ranked NCAA Division III competition. Mitei, a sophomore, won the Region V title in 17:27. She also earned the individual title at the Mustang Challenge Open earlier this season. Hayman, in his first year at Louisburg, led his squad to the Region X title. DeGrado, in his fifth year at Allen (Kan.), led his team to the Region VI title. Albrecht, in his first year at Vincennes (Ind. ), led his team to the Region XII title. Brown, in his 14th year at Iowa Central, led his team to the Region XI title. Anderson in her first year at the College of Southern Idaho, led her team to the Region XVIII title. DeAngelis, in his fourth year as the head coach at Mercer, helped his squad capture the Region XIX title. Reith, in his third year at Colby, coached his team to the Region VI title. Herron, in his 15th year at Lincoln, guided his program to the Region XXIV championship. Masterson, in her second year at Trinidad State JC, coached her team to a Region IX title.